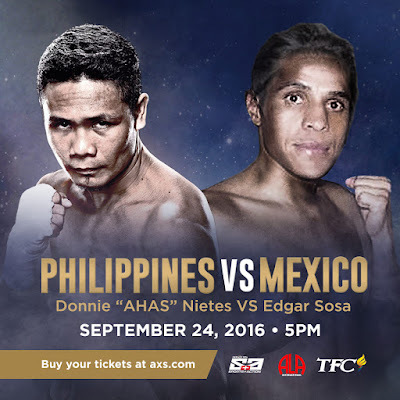 Pinoy Pride 38: Philippines vs Mexico featuring the former minimumweight and light flyweight world champion Donnie Ahas Nietes vs the former world champion Edgar Sosa of the Philippines. How to watch in Local Philippine TV? Pinoy Pride 38 will be telecast delayed on ABS-Sports channel 2 at 3:30 PM. You can also watch it late at 7:30 PM at (SNA) ABS-CBN Sports and Action channel 23. You can watch the fight live via SKY Cable PPV or if you have TVPLUS you can watch it live by texting LABAN99 Nietes (TVPLUS no.) and send to 2131. You can also watch it in IWANTV.com using you ABS-CBN Mobile. Just text LABAN99 NIETES and send to 2131. After that, you can now watch the fight live via iwantv.com. Pinoy Pride 38 will be telecast live from Stub Hub Center in Carson California. Fight starts at 8AM on September 25, 2016 (Philippine Time).